No one likes to have a cold sore on their lip. Cold sores can be uncomfortable, unaesthetic and inconvienient. They generally break out in response to trauma, or whenever physical or psychological levels spike. Once you experience the tell-tale tingling sensation, it is only a matter of time before a full blown sore appears. Then, healing can take as long as two weeks, and quality of life may be significantly compromised. Therefore, it is critical to begin laser treatment before the sore has had a chance to develope. We can successfully treat cold sores with lasers today. Lasers help to reduce the duration and size of the lip infection. For best results, treatment has to be initiated as soon as the lip vesicles arise and the lip feels itchy. Once the infection reaches the crusty stage it is too late for treatment. Catch it in time with laser treatment and the cold sore may not break out. What are the benefits of lasers in treating cold sores? Profound relief usually within minutes. The laser's light energy promotes healing through gentle photo-biostimulation deep within the lip. 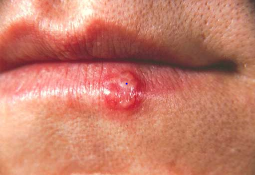 After treatment, sores recur with less frequency and less intensity at the same location. There is virtually no discomfort during or following laser treatment of cold sore. The use of a dental laser may make you feel more comfortable and less anxious during your treatments. If you are interested in learning more about procedures that use soft tissue dental laser technology, please Contact Us.